At some point in June in the year 2000 I had a nasty cold. At that same point in June, I desperately needed to renew my passport in time for a trip that was already planned. Sickness aside, I had to get some passport photos taken. I wore an unflattering, long-sleeve black shirt. My hair was disheveled and pointing in various, inappropriate directions (mostly up). And my face was swollen. I always have some type of bags under my eyes – it’s just my face. But these swelling circumstances were extreme. I imagine the photo-taker at Kinko’s (this pre-dates their conversion to Kinko’s FedEx) must have been thinking something along the lines of, “I hope this young woman is taking these photos for personal reasons and not planning to send them to a government agency to use as a form of long-term identification when traveling internationally.” Too bad no one said anything like that to me at the time. The sickness must have been talking. Because how I could have approved the photo is beyond rational thought. But I sure did walk out of that store with an incredibly unflattering and unattractive photo of myself in a bag, two copies of that photo to be exact. And I sure did go to the 24-hour post office to ship off a passport application with those two unflattering and unattractive photos attached. And I sure did receive a passport in the mail not too much later with that unflattering and unattractive photo permanently laminated into an official U.S.-issued passport. With my nose no longer running, and with my eyes no longer virtually swollen shut, I was able to see the grave results of my error in judgment. It’s not so much that I was hideous in the photo. I’m not the type to be critical of every not-so-great photo that’s taken of me. It was more about the expiration date: June 2010. 2010??!!?? A bad photo that lasts a decade is far worse than your everyday bad photo on Facebook. My previous passport was for youth and expired after five years, which was bad enough. 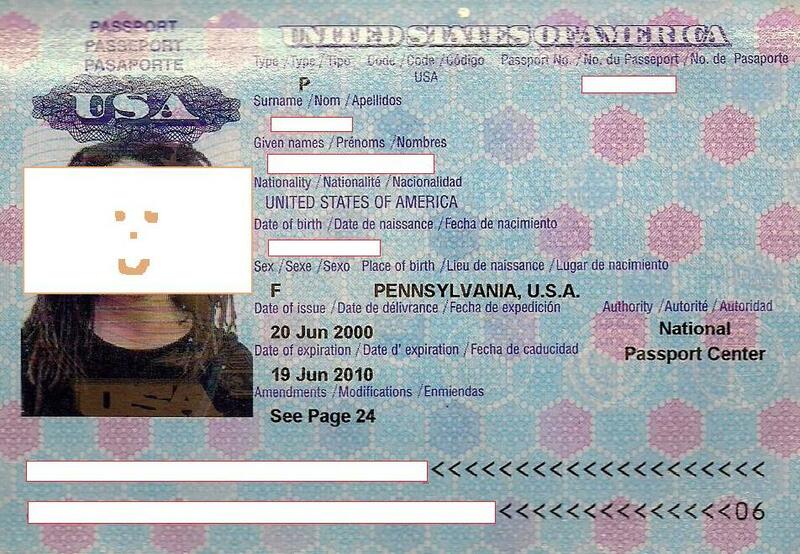 But with an adult passport, I was committed to that photo for ten whole years. All of my twenties. I traveled every year, each time reminded of uglier days. What a cruel system. Even if just for a brief moment, every time I made sure I had my passport on the way to the airport, the photo crossed my mind. “And now countless more people are going to ask to see this thing. Argh.” Brief moments of anxiety every time I handed it over to someone. Occasionally I received comments – things like, “you look different” or “this is you?” But more often I interpreted their quiet expressions as looks of pity. I’ve been waiting for 2010 for ten years. In January I thought, “this is the year when I get a new passport!” But with this anticipation comes pressure. Officially it expired in June. And I’ve been putting off the application, over-thinking the new photo. How do I make this the best photo I’ve taken in my life (which is a fair standard for a photo I’ll carry with me and show to people all over the world for the next ten years) while not trying too hard and appearing natural? Although I’m tempted to pay for a hair and make-up stylist before heading into Kinko’s FedEx, I know I also wouldn’t be proud to carry around a glamour shot passport that looks nothing like me. I’m planning to get over my ten years worth of passport photo anxiety on Friday. I’ll march in there with a semi-rehearsed, casually natural smile, an outfit that accidentally looks really good from the shoulders up, coincidentally recently threaded eyebrows, and by chance recently washed and twisted hair. Not only am I working on making my thirties the best years of my life (so far). Here’s hoping they’ll also be the best years for my passport.